Assembly is a simple and fairly easy affair with no discernible differences from its predecessor in terms of instructions and steps. Standing back to take a look at this new version we really like the look of its appearance. Gone is the glossy white and silver colour scheme, replaced with sleek matt black coat and a little bit of silver trim. 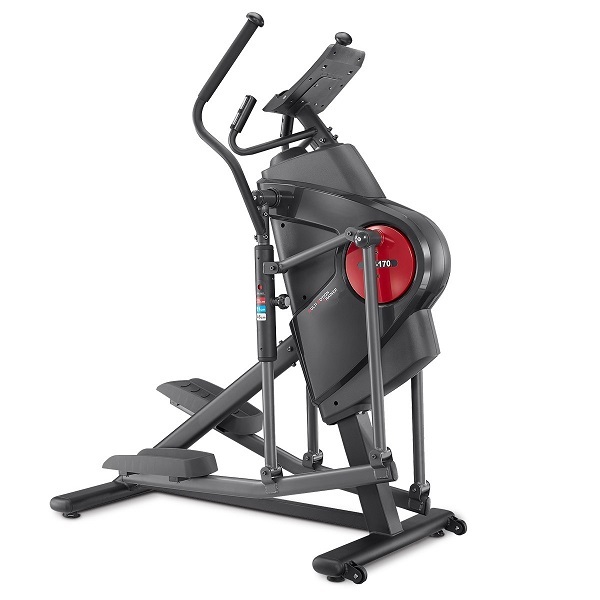 DKN tell us that the actual shape is the same but that black finish completely changes the way this cross trainer looks. And it looks GOOD! Somehow appearing less in stature we think this new colour will allow this machine to fit quietly in the corner rather than stick out and appear to take up lots of space in a room. It looks sleek and modern, very 21st century. The looks then, get a thumbs up so onto what it’s like in action. As we’ve come to expect from DKN machines, the XC-140i Black is quiet and smooth. That 14kg flywheel doing a good job of ensuring the action is smooth and steady throughout the whole cycle. Like its predecessors, the XC-140i black is solid and steady, which is to be expected as the change here is mostly, but not entirely, cosmetic. The stability and sturdiness do make you feel like this is a bit of kit that’s been built to last though and that’s backed up by the specs confirming it’s good for users up to 120kg (18.89 stone in old money). 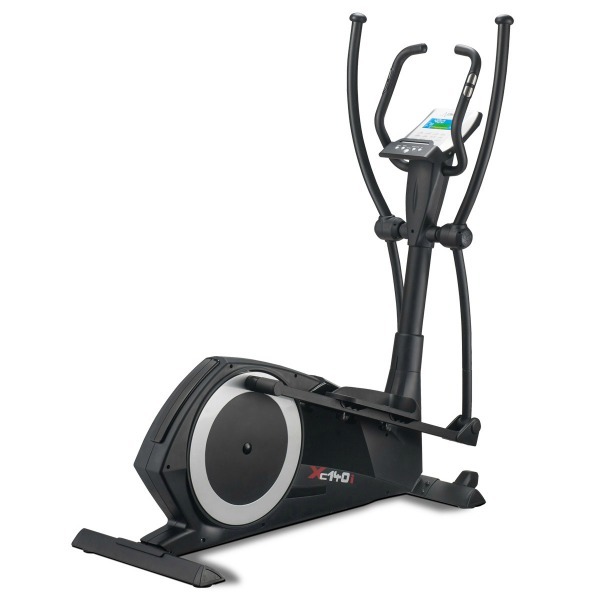 In short, this isn’t a toy, it’s a proper cross trainer that’s obviously been built well, and the designers have clearly thought of a machine that’s actually going to be used rather than a glorified coat hanger that’s used 3 or 4 times a year. The XC-140i Black has a 16” stride length which DKN say is suitable for users who are up to 6 ft (1.83cm) tall but we can’t help feeling they’re probably being a bit overly cautious with this. One of the chaps in the office is 6’2” tall and didn’t feel restricted on this machine. Like previous versions the XC-140i Black features adjustable footplates enabling you to get a very good position regardless the length of your arms. There’s a choice of 3 positions and as having to go through the process of undoing nuts and washers and then putting them back on isn’t something that you’d do to adjust the set up for each person before their workout, it’s really a one-time thing. Something you’ll take your time doing on the initial set up and then leave well alone once you’ve found the right position. This does enable you to get a really nice, comfortable grip on the moving arms which comes into its own when you’re tiring during your workout. At this price point it would be unrealistic to expect the actual ‘angle’ of the footplates to be adjustable and while this is getting more common, it’s still not something that we’d expect to see on a machine like this. That’s still a feature that tends to be reserved for more expensive ,models. However that being said, the angle of the plates on this version has been set to a very much ‘one size fits all’ position and is comfortable enough for you to really punch it hard during your workout and still feel comfortable. 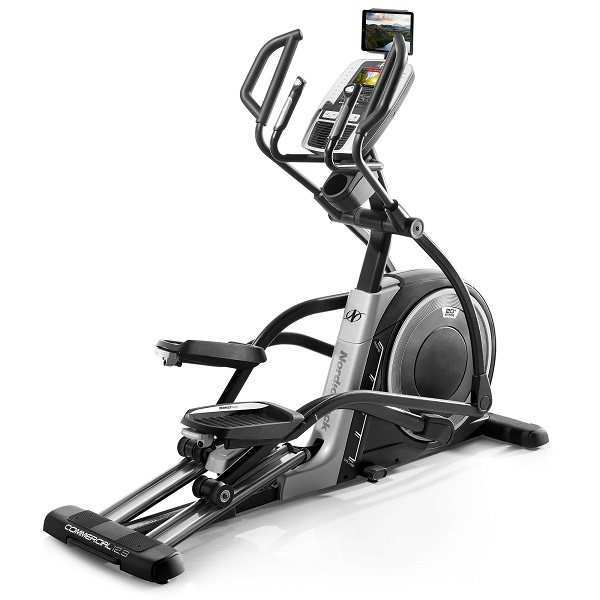 When an elliptical has been designed well it’s not your joints that should feel the pain, it’s your muscles. And this new version of what’s a very well established model stays true to that principle. It’s always tempting to tinker with this sort of thing in the pursuit of perfection and those tweaks designed to bring you closer to the ideal machine can, and often do, end up making things worse not better. But DKN have had the good sense to remember that if it ain’t broke, don’t fix it! And to a large extent they left well alone. But, tweaked it they have, and with the way this machine feels, we think they’ve made the right call here. It’s smooth, quiet and comfortable, to an almost magical degree for a machine at this price, and you really can’t ask too much more than that! 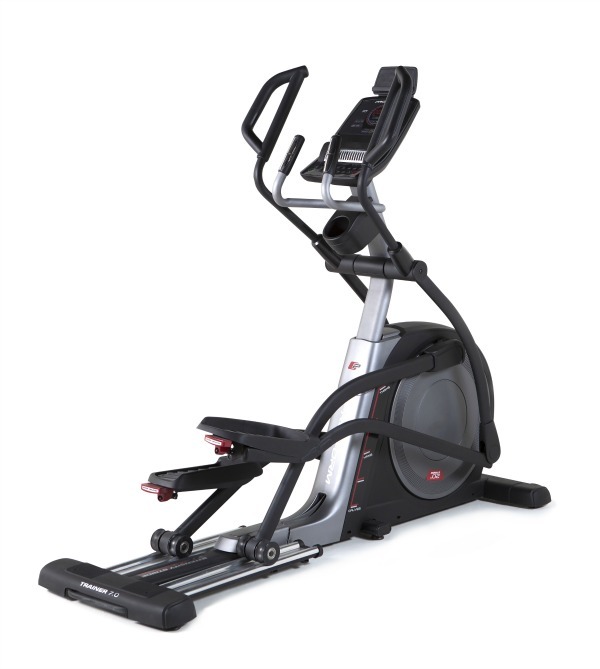 The benefit of a cross trainer with dynamic handles is that it offers a TOTAL body workout! Hence the phrase ‘cross trainer’! The moving handles on the XC-140i coped very well with the stress of making sudden directional changes in stride (from forwards motion to backwards motion) even with the bigger guys in the office having a go, and proved that they were as substantial and durable as they’ve ever been on this model. No evidence of corner cutting! Instead of the usual ‘straight up and down’ static handles typically found on most models, the fixed handles on the XC-140i Black are curved over at the top, allowing for various different hand placements and positions should you not wish to make use the pulse grip sensors. One of the areas where DKN have made a tweak here is in the console which has inbuilt heart rate receiver that’s now been upgraded to a Bluetooth version. The Bluetooth upgrade worked flawlessly on our test model and we can see why more manufacturers are turning to this standard. It was good before, now it’s great. 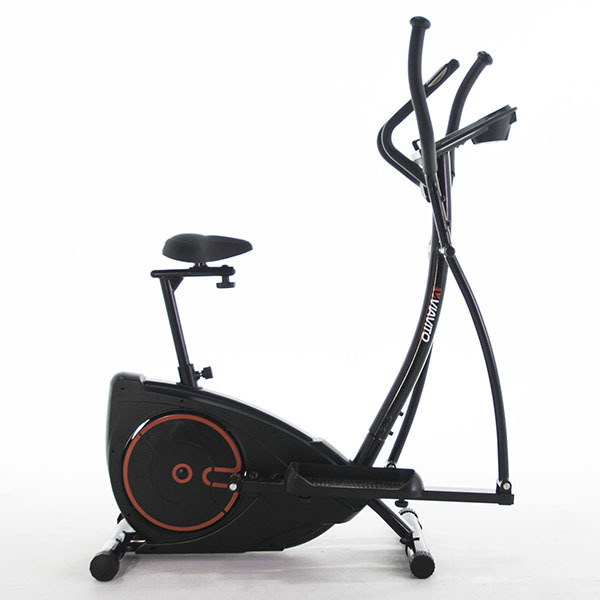 When we used it with the heart rate control workouts it performed brilliantly and is a very welcome change. With regards to the preset workouts built into the console, there’s a diverse selection of a dozen pre-set courses, each of which is scalable. The beauty of this is that you can take a workout you enjoy that’s in, let’s say, the beginners section, and ramp up the difficulty. So once you’ve found a workout with a format you enjoy, you can make it harder as your fitness improves. This may seem a small thing but the thing is with home fitness equipment is that if you don’t really enjoy using it – you won’t! Hence all the expensive coat hangers on eBay 🙂 It’s really important to be able to settle into a routine that you enjoy, so being able to easily tailor a workout to suit you is not as small a thing as it seems. In addition to the preset workouts there is also a manual mode that allows you to either just get moving, or to set a target for time, distance or calories where you control the resistance and there’s a watts based program too. Like on previous models each option is easy to set-up thanks to an intuitive layout and a visually clear display screen. Your training data is set out in sections around the sides and across the top of the screen. The time display and pulse readouts are given extra space for clarity and the largest section in the lower middle of the screen shows the program selected with the profile or intensity levels made up by strips of blocks. 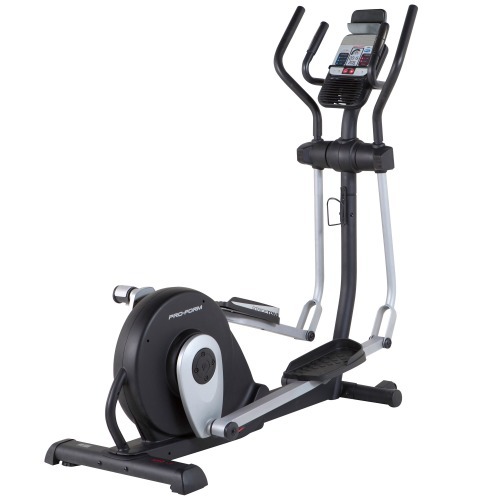 This elliptical has a Bluetooth module which makes it possible to control it from a tablet or phone with a compatible app installed. There are a few apps out there that work with DKN machines and our favourite one is Kinomap. This provides rolling videos of real trails and the app controls the resistance on the XC-140i to simulate the gradient of the terrain. It’s good fun to use and can take away the boredom that can sometimes set in when doing lengthy cardio sessions! 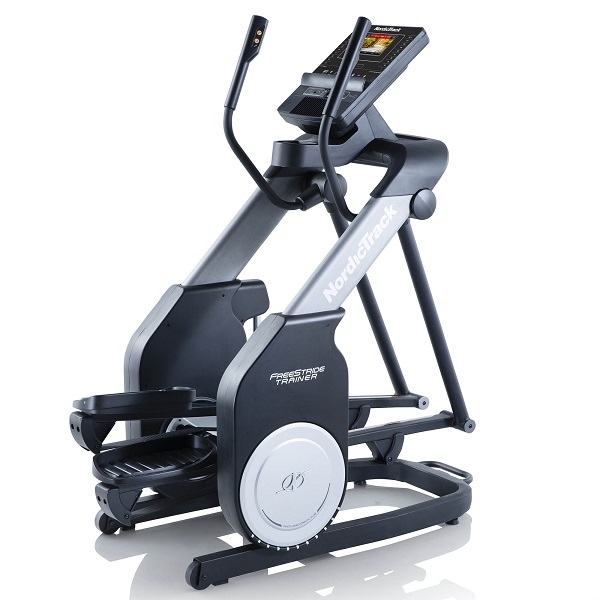 If space is an issue and you need to be able to take the cross trainer out to use it and then put it back again, the XC-140i Black is quite manoeuvrable. Just lift the back of the unit and it settles on wheels at the front which make it easy to move around. 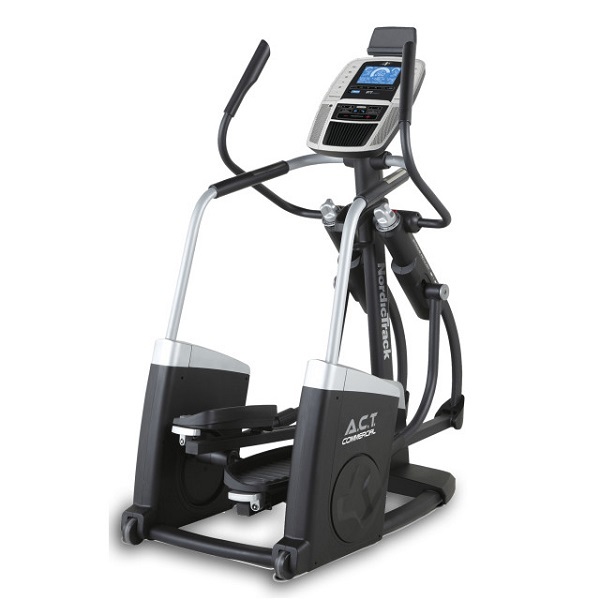 It’s not ideal to have to use a cross trainer like this, but if you do need to this machine makes it as easy as you could reasonably expect. This latest version of the XC-140i isn’t loaded with tons to add-ons. There’s no water bottle holder, no speakers, no gimmicky fan. Instead, DKN have done what they’ve always done. Focused on the things that matter. The things that make a good fitness machine. The money’s gone on components that you don’t see, or feel, or hear. And that’s the point here. 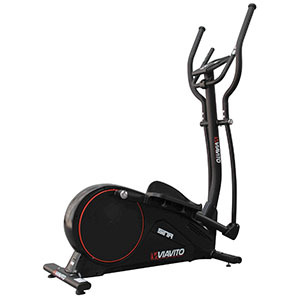 This is a model that has history and will deliver a very good workout, with some add-ons that help to keep things interesting, while at the same time being reliable, smooth, comfortable and quiet. After all, isn’t that what having a home fitness machine is all about? 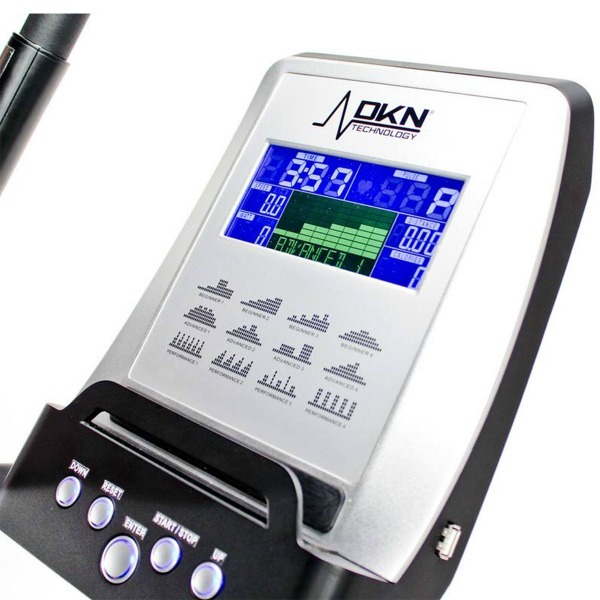 To get the XC-140i Black for only £469, use code XC140 on the DKN-UK basket page! The XC-140i Black is more about evolution than revolution. A delicate tweak here, a sensible upgrade there. We understand from DKN there are also some newer components inside, unseen and unheard, that should increase the reliability of what is already a hugely successful model. We love the new look, and the addition of Bluetooth heart rate receiver is a sensible addition that materially improves what is already a good machine with a strong track record.